Getting a mani/pedi every other week would definitely be a simple luxury I would partake in if I had more money than I knew what to do with. However, because that is not the case and I am capable of giving myself a mani/ pedi that looks real, I'd rather save those $$$ a month to use on clothes, shoes, accessories, something for my house, dog necessities, food, etc. If you have not tried Essie Gel, I am so happy to introduce you to it! It's not the newest product on the market, but it is one that I love and think you should know about if you do not already! Yes, it is a little more expensive than regular nail polish. However, it lasts a lot longer and truly gives you a "real mani/pedi" gel-like shine. Plus, you have the exact color at home, so you can touch up one of those inevitable chips whenever they do occur! And instead of paying $50+ for one mani/pedi at a nail salon, it will be a much lower cost. Plus, you will be able to continue using the polish for months on end! Essie gel can be found at Ulta, Nordstrom, and on Amazon. It can sometimes be found at Target, CVS, Walgreens, as well as other stores. Step 1: Apply a base coat. I used an OPI base coat, just because that is what I had on hand. You can use any brand. Essie claims you do not need a base coat with this polish, but I think the base coat helps your mani/pedi last longer and then it also makes removal easier. Step 2: After the base coat dries, apply your first coat of the Essie Gel Couture color of your choice. I went with #138 Pre-Show Jitters. I love a pale, almost white, pink polish, and that's how this color looks on your nails. Step 3: After the first coat of Essie Gel Couture dries, apply a second coat. Step 4: After the second coat of Essie Gel Couture dries, apply your Essie gel. This gel is like the gel at a salon, but it does not require the ultraviolet light. Once you apply it, your nails will dry really quickly! And they should last a long time! Step 5: Enjoy your lovely, shiny nails for up to two weeks! And you can use this gel polish acetone remover when you want to take the polish off your nails. You might have noticed that my fingernail polish was located on top of a chest, and I did not paint my fingernails in that location. I moved to the kitchen table. This is because I have had the experience where I made the decision to paint my fingernails while sitting on the sofa when something went terribly wrong. My fingernail polish was sitting on the end table, and for some unknown reason, my hand flung the neon pink fingernail polish across the end table and onto the cream-colored rental house carpet. In my crazed mindset of losing our entire deposit and having to replace an entire house worth of carpet, I went and grabbed every cleaning supply we own. I started scrubbing the bright pink polish with nail polish remover, Windex, Scrubbing Bubbles, Resolve, etc. You name it, I tried it. When I realized that wasn't cleaning it, I eventually sat back on the sofa and got on Pinterest to look up ways to remove fingernail polish from carpet. For future reference (although I truly hope this NEVER happens to you), after the fingernail polish spills, DO NOT SCRUB. According to my Pinterest research, you should calmly wait for it to dry and neatly use scissors to trim the very top layer of carpet that was hit by the neon pink polish, or whichever color you may choose to use. By taking this route, you will not have scrubbed the color into the very deepest layer of the carpet and have to cut all the way down to the bottom to remove the very bright color. Obviously this option will not work on all carpets or rugs, but it is a tip to try out on those carpets that do have a top layer that can inconspicuously be trimmed up a bit. OR, you could avoid this situation completely by painting your nails over a hard surface and nowhere near a carpeted area. This was one of those things where I thought I was being super careful and this dilemma would never happen to me. It happened, and I learned my lesson. With serious perseverance, I ended up getting the majority of the nail polish out of the carpet and we did indeed receive all of our deposit back when we moved out. However, I suggest you do yourself a favor and do not risk being in this situation! Learn from my mistake, and when painting your nails, make sure to choose a location that will not cause a huge ordeal if a spill were to happen. 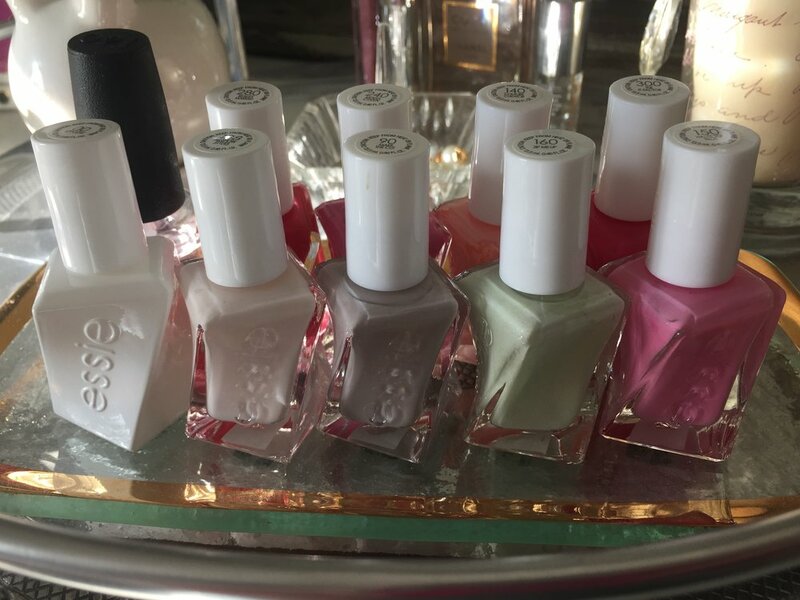 To sum things up, be careful where you choose to paint your nails and invest in some Essie Gel Couture polish and gel You will not be disappointed! Do you have any favorite nail polish brands and colors? Also, do you have any nail polish horror stories? PLEASE tell me how you managed to come out on the other side! I am more than happy to hear any and all tips! Thanks so much for reading!